Promoting Good Health » Blog Archive » Organic vs Conventional foods: Part 2 – Healthier for you? Organic vs Conventional foods: Part 2 – Healthier for you? Organically produced foods are no more nutritious for you than those produced using conventional agricultural methods. Organically grown produce does have higher levels of certain nutrients than conventionally grown foods. Organic produce has less pesticide contamination than conventionally grown crops. Organic foods contain less antibiotic-resistant bacteria than do conventionally grown foods. In this blog we will look at the first of these categories: Healthier for you. For this discussion, healthier for you means the nutritional content of organically grown food compared to those grown using conventional methods. These are points 1. and 2. on the above list. In the Promoting Good Health publication “Organic Food: A Guide for Consumers“, we discuss how difficult it is to come to a sensible conclusion on whether organic food is more nutritious for you (2). Given the media flurry over the Stanford study, we need to again discuss why this seemingly simple question is very difficult to answer. The Stanford study makes a genuine attempt to review the available literature, citing close to 300 previous publications and looking at over 200 different studies. And while the Stanford study is thorough and comprehensive and does make a genuine attempt at comparing and summarising the nutrient content of organic and conventionally grown foods, it is fundamentally flawed in this regard. And there are others who have similar concerns (5). It is far more important to understand why the Stanford study is fundamentally flawed than to raise any specific criticism of this particular study. So let’s look at why the Stanford study is flawed because it is very important you have a clear understanding of why and, more importantly, what it means for you and your family. While all food is made up of proteins, carbohydrates and fats, there are literally millions of other vitamins, minerals, trace elements, phytonutrients, anti-oxidants and compounds in the foods you eat which your body needs and uses every day to keep you healthy. So where do you start? Which nutrients do you measure? How do you know which ones are the most important? Yes, you have to start somewhere and surely the 20 or so nutrients measured in the Stanford study are enough to tell us something useful? And in that perfectly understandable and logical assumption is the illusion and the trap and why the Stanford study and others like it are fatally flawed. Yes, you have to start somewhere but there are limits to what you can measure. And even if you can measure something and measure it very accurately, the measurements have to have real-world relevance. They have to reflect what is going on in your body. We’ll come back to this in a minute. These results were however based on either a small number of studies or were not statistically “robust” and so may not be real or reliable. Because of the variability in the reports examined in the Stanford study, no statistically significant differences were found between organic and conventionally grown foods for any of the other nutrients examined. So based on the published reports analysed in the Stanford study, the authors concluded there was no strong evidence to suggest organic foods were more nutritious for you than foods grown by conventional means. Others do not agree (5). While this is what the Stanford study did say, free of bias, vested interest or selective reporting of the results, we have already said the results of the Stanford study is fatally flawed. We now need to look more deeply into why. 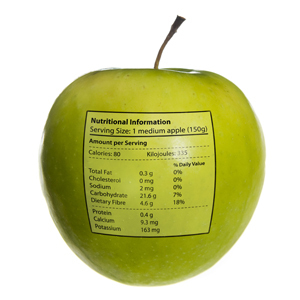 Assigning a nutritional value to a food based on the small number of nutrients looked at in the Stanford study or in the “Nutritional Information” on the packet is like trying to assess the worth of a piece of writing by measuring the number of times the letters “e”, “a” and “r” have been used. Sure you can get a very accurate measurement of how often each of these letters are used but it doesn’t tell you anything useful about the quality of the writing. The effect of the 23 letters you didn’t measure and the order of those letters has infinitely more effect on the quality of the writing than how many times the letters you did measure were used. So what effect will the nutrients you don’t measure have? What about their combined or synergistic effects? Are the nutrients in a form your body can take up or use? And how do you define what is a nutritionally beneficial effect anyway? Everything you are and everything your body needs to function at its peak must come from your food. Food is much more than its calorific content and the “Nutritional Information” shown on the packet is next to useless. There is also the question of what you bring to the experience. Unless you have an identical twin brother or sister, the wondrous interplay of the genes passed down from your mother and father and from all the generations that came before them, makes you genetically unique. There is no-one on the planet who is just like you. And because of your unique genetic variations, how you process the foods you eat and the chemicals you come in contact with will be different to the way others process the foods they eat and the chemicals they come in contact with. Because everyone deals with the nutrients in food a little differently, the nutritional value of a food will not be exactly the same from person to person. These genetic differences also mean not everyone has the same requirement for a particular nutrient. And these differences can be huge. If your genetics has given you a severe food allergy for example, your body can turn something highly nutritious into something potentially deadly. In this case, one man’s meat really is another man’s poison. So while you can measure the level of a nutrient in the food, it does not tell you if your body can absorb or use it, how that nutrient will react in your body or if your body needs it at that particular time. It also has to do with timing. For the last 3 years of high school I had to study the works of Shakespeare as part of the set curriculum. At the time I was too young and naive to understand the meaning and significance of what I was reading. Too inexperienced in the ways of the world to recognise the greatness of the writing and the powerful insights they gave into human nature. Now, with a few more years and life experiences behind me, the same works mean a great deal more to me. The works of Shakespeare haven’t changed. I’ve changed and my reaction to Shakespeare’s works has changed as a result. So it is with your mind, so it is with your body. As you age the way your body processes foods changes, as does your body’s requirement for particular nutrients. This adds another layer of complexity that has to be taken into account. There is another thing we need to discuss about nutrients in food that is almost impossible to factor into studies comparing nutritional content. Some of the nutrients in food start to disappear as soon as the fruit or vegetable has been picked. And this happens irrespective of how the food was grown. Try this experiment. Pick three apples off a tree. Eat one straight away, while it is still warm from the sun. Feel the sweetness of its flesh, the juiciness, the crunch and freshness as you bite into it. And how good does it taste? Now put the other two apples on the kitchen bench and leave them there. Eat one the next day and see how that feels and tastes compared to the one you ate fresh off the tree. Now wait another three days and eat the last apple. How does it look? How does it taste, or feel in the mouth? Are you enjoying eating it as much as you did the one fresh off the tree? I doubt it. What’s happening here? Each of these apples was picked at the same time from the same tree. Their nutritional content should be the same shouldn’t it? Then why do they taste so different? It’s because the nutrient content has changed since they were picked. And even if the gross measurement of total protein, carbohydrate, fat or energy content may still be the same, we know food is much more than this. As was discussed above, the food you eat contains thousands of nutrients, some of which start to disappear within minutes of the food being picked. Others may take hours, days or weeks to break down. You don’t need a PhD in biochemistry or sophisticated measuring equipment to prove it either. Nature has provided you with all the equipment you need to determine whether food is fresh or not. It will look fresh. It will feel fresh. It will smell fresh and it will taste differently. And the longer the gap between when the food was picked and when it was eaten, the more nutrients will be lost. So fresh is best and applies irrespective of how the food was grown. And how long the food took to get from farm to shop to you and how it was stored will have a profound effect on its nutritional content. Potentially, much more than how it was grown in the first place. So while we can ask whether a food contains a specific nutrient and can measure it very accurately, whether that automatically means the food is better for you because of it is something you cannot say. That is a question too complex for a “Yes” or “No” answer. Not everything can be shortened to a bumper sticker. Being aware of what you can and can’t prove and how important time from harvest to plate is in determining how nutritious your food will be is a very important and useful piece of information. It means you can tell the difference between marketing hype and scientific reality. And that’s what Promoting Good Health is all about. So if the Stanford study or any other study like it can’t reliably tell us whether or not organically grown food is healthier for you than foods grown using conventional methods, what can it tell us? That’s the question we will address in the third and final part of this blog. Until then, stay happy and healthy. (1) Smith-Spangler, C.; Brandeau, M. L.; Hunter, G. E.; Bavinger, J. C.; Pearson, M.; Eschbach, P. J.; Sundaram, V.; Liu, H.; Schirmer, P.; Stave, C.; Olkin, I. and Bravata, D. M.: Are organic foods safer or healthier than conventional alternatives? : A systematic review. Ann. Intern. Med., 157 (5), 348-366, 2012. (3) Organic vs Conventional foods: Part 1 – Which is better? (4) A measured difference between sample groups is said to be “statistically significant” if it passes a mathematical test for whether the observed difference is due to chance or not. A difference is usually said to be statistically significant when there is less than a 5% possibility the observed difference is due to chance.